(CNSNews.com) - The federal government collected record individual-income-tax revenues through the first quarter of fiscal 2018 (October through December), according to the new Monthly Treasury Statement. This was the last quarter before the new tax-cut law signed by President Donald Trump on Dec. 22 took effect. Despite taking in record individual-income-tax revenues, the federal government ran a deficit of approximately $225 billion during the quarter. The Treasury collected a record $390,847,000,000 in individual income taxes in October through December, according to the Treasury statement. That was $30,568,380,000 more than the $360,278,620,000 that the Treasury collected (in constant December 2017 dollars) in individual income taxes in the first quarter of fiscal 2017 (which ran from October through December of 2016). Fiscal 2016, when the Treasury collected $366,424,140,000 in individual income taxes in the first quarter (in constant December 2017 dollars), now ranks as the No. 2 all-time year for first-quarter individual-income-tax collections. Total tax collections in the first quarter of fiscal 2018 equaled $769,512,000,000. 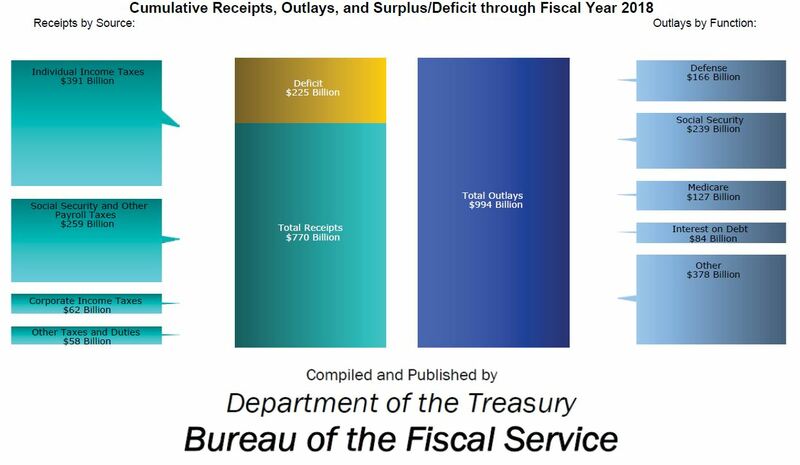 But because the government spent $994,467,000,000 during the quarter, the Treasury ran a deficit of $224,955,000,000. 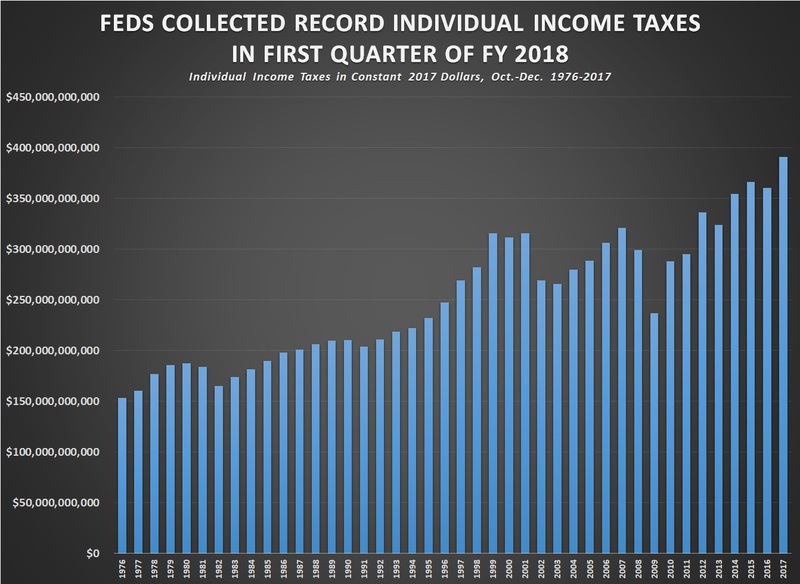 The $769,512,000,000 in total tax revenues during the quarter did not set a record for first-quarter total tax collections. It was more than the $756,394,470,000 in total taxes (in constant December 2017 dollars) that the Treasury collected in the first quarter of fiscal 2017, but less than $798,012,340,000 in total taxes (in constant December 2017 dollars) that the Treasury collected in the first quarter of fiscal 2016. The $769,512,000,000 in total tax revenues collected in the first quarter of this year included not only the record $390,847,000,000 in individual income taxes, but also $62,052,000,000 in corporate income taxes; $259,165,000,000 in Social Security and other payroll taxes; $19,458,000,000 in excise taxes; $5,258,000,000 in estate and gift taxes; $9,446,000,000 in customs duties; and $23,588,000,000 in miscellaneous government receipts. According to the Census Bureau, there were 126,224,000 households in the United States in 2017. The $769,512,000,000 in total taxes collected by the federal government in the first quarter of fiscal 2018 equaled approximately $6,096 per household.